Makers to watch in 2016 headline the new BLADE®, on newsstands now! 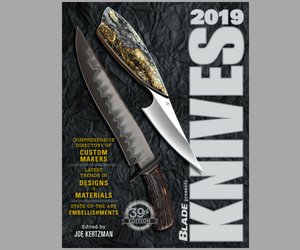 The makers to watch in 2016, tomorrow’s blade material today, deep-belly vs. recurve blades and more highlight the new BLADE®, on newsstands now! Headlined by the cover knife by one of the makers to watch for the new year, Jared Price’s tactical folder in bacon-pattern stainless damascus, the latest issue focuses on five cutlers who are building some of today’s most exciting custom knives. In addition to Price, those makers are ABS journeyman smiths Karl B. Andersen and Ben Breda, Michael Raymond and Richard Rogers. Find out why they made our list, examples of their hottest knives and more. SM-100 is a recently developed titanium alloy that exhibits key traits desirable in a great blade material. Also known as HIPTiNite, the material is used on special models by Strider Knives, knifemaker Eric Bono and others. Get the background story on this intriguing material in Pat Covert’s story. Machetes and big knives have been appearing in droves in the factory industry, and a number of them opt for either full, wide blades or those with the “S” curve, or recurve. See how the two styles perform, including a sidebar on the concept of weight-forward blade design, in “Belly Up To The Recurve Bar” by Abe Elias. Also this issue: check out the stories that made headlines over the past year in “It Was A Keen ’15”; enjoy an excerpt from the World’s No. 1 Knife Book, KNIVES 2016, entitled “Chopped Champions” by Joe Kertzman; consider four of the latest factory slip joints and how the traditional design is evolving in general in “Slippin’ and A-Slicin'”; read about the latest knife maintenance products and how they keep your knives performing well and looking good in “Nourish Your Knives”; see how two custom fillet knives compare in Kim Breed’s tests; check out ABS master smith Henry Torres’s hunter’s axe and the many options Henry offers thereof, and much more, all in the latest BLADE®. Previous articleNEW BLADE Show Website is Live!